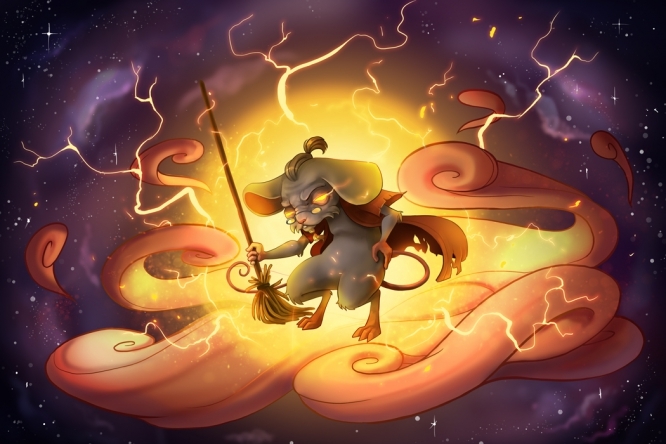 The Ascended Elder Mouse is a breed of mouse found in the Furoma Rift. It is the Rift version of Hapless Mouse. Cheese: Ascended Cheese Charm: ?? With lives nearing completion, their bodies have grown weak in their old age but their spirits have grown strong, so strong that they can barely be contained in any physical realm. Focused on finding "oneness" through menial but meaningful work, their training has come full circle, back to where students begin. Sweeping the grand floors of the Grand Pagoda, they find greater meaning, purpose, humility and spiritual wholeness through this act of cleanliness and self-sacrifice. The Ascended Elder Mouse has been found to be especially attracted to Ascended Cheese, to the point that any other kind of cheese will simply not suffice. Only Rift type traps are very effective against Ascended Elder Mouse, all other power types are ineffective. The Ascended Elder Mouse drops the Ascended Elder Egg during the annual Spring Egg Hunt. 18 May 2016: Ascended Elder Mouse was released with the release of Furoma Rift. This page was last edited on 31 August 2017, at 08:47.